Two of the stand-out tracks from "Hit The Floor" get exclusive re-works for this EP. 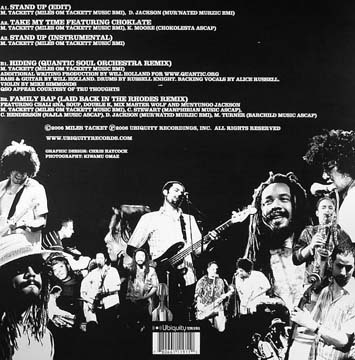 Also included is an alternative laid-back rhodes-heavy version of DJ-favorite "Family Rap" that has yet to be made commercially available. If you missed "Family Rap" first time out it's an old school posse cut in the spirit of the live-band old school rap jams a la the Treacherous 3 and Grandmaster Flash. This one features West Coast friends and family Chali 2na and Soup of Jurassic 5 and Double K from People Under The Stairs. Vocalist Choklate steps out from behind her hot underground hip hop soul single "Waitin" to deliver a new super bad soul sister vocal over the instrumental of "Stand Up", while UK producer Quantic makes an old-school soul version of "Hiding". Hotness! 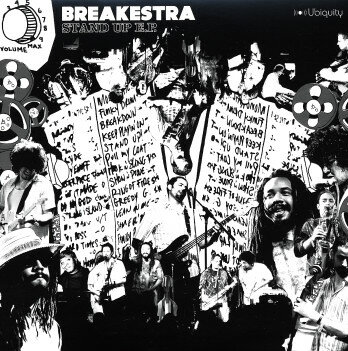 Breakestra embark on a tour of Australia (alongside James Brown, Norman Jay, Talib Kweli, Jean Grae, Z-Trip) and Europe (including two dates at the Jazz Cafe in London plus dates in Germany, Netherlands, Belgium, Switzerland, England, Ireland, France) this March and the single will be released just as they return home.